Every Sunday, millions of dollars are paid out to poker players around the world when sites like 888poker, PokerStars, and partypoker host the week’s biggest and best online tournaments. Each week, we take a look at how players from Canada fared in the Sunday majors. The usual premier Sunday tournament on 888poker boasts a guarantee of $100,000 for a $215 buy-in. This week saw 314 entries with 155 rebuys creating a total prize pool of $100,000. This week Canada was shut out of the final table. The winner of the tournament was Ramiro "lasochobi" Petrone of Argentina who won $19,500 for the victory. The Whale is 888poker’s high-roller tournament of the day with a buy-in of $1,050 along with a $60,000 guarantee. This tournament saw a total of 45 entries with 17 rebuys to create a total prize pool of $62,000. This week one Canuck found a spot at the final table but "DosPoochies" finished outside the money in ninth place. The winner of the tournament was “Madeon1994” of Sweden who won $20,054.90 for the victory after cutting a heads-up deal with fellow Swede "Creutz93". The biggest tournaments of the day get started on PokerStars every week with the $55 Sunday Marathon. This week, the Marathon got a Guarantee Boost to $125,000 guaranteed. A total of 2,543 entries showed up to create a prize pool of $127,150. Canada failed to find a spot at this final table. Chile's Nicolas "PKaiser" Fierro managed to outlast the field though to win $12,990.19 in a three-way deal at the end. The $215 Sunday Warm-Up heats up the action with a Guarantee Boost to $200,000. After late registration there were a total of 1,031 who bought into the tournament to create a total prize pool of $206,200. Of the final nine players, two players were sporting the maple leaf. Ami "UhhMee" Barer took fourth place for a score of $12,436.27 but American poker nomad Bryan "bparis" Paris outlasted them all wearing the maple leaf and took home $33,458.20. Moving on to the lowest-priced tournament that could be considered a Sunday major, the $11 Sunday Storm is the best value you’ll find in online poker. Despite the tiny buy-in, the guarantee is set at $225,000. The tournament this week saw 21,623 players enter, creating a prize pool of $225,000. Canada took a bagel for this final table, but Romanian player “ninugaf” took down first place worth $20,852.29. The highest-priced regular Sunday major on PokerStars is the Sunday High Roller with a hefty buy-in of $2,100. This week, the tournament got a Bounty Builder boost as Bounty Builder Series 04 and a whopping guarantee of $500,000. With 403 entries this week, the total prize pool ended up at $806,000. A single Canadian made the High Roller final table this week. "n3xD" managed fourth place for $32,135.58 from the main pool plus an extra $11,458.75 in bounty bonus. The winner was Argentina's Ivan "negriin" Luca who outlasted them all to collect a main prize of $72,909.23 plus $92,671.87 in bounty cash. This is the most coveted online poker tournament in the world with a buy-in of just $215 but a $1,000,000 guarantee. This time around, entries came to 5,202 to create a total prize pool of $1,040,000. Canada failed to find a seat at the Milly final table this week. The win, worth $140,572.39 went to “Wild_Smurf” from the Germany. Giving the Sunday Million feel for a tenth of the buy-in is the weekly Mini Sunday Million where the buy-in is $22 with a $175,000 guaranteed. This time around there were a total of 8,717 entries to create a total of $175,000 up for grabs. Additionally, all players to make the final table get a ticket to the full Sunday Million. No Canadians survived to the final nine. The player with all the chips at the end was “Dividik17” from Russia, worth $15,900.31 after a three-way deal at the end. With a buy-in of $530, the Sunday 500 guarantees $100,000. A total of 252 entries beat the guarantee, coming in at $126,000 to play for. No players with the maple leaf made the final table. The winner was “edudrake1987” from Brazil who pocketed $24,235.71 for the victory. The Sunday majors conclude on PokerStars with the $215 Sunday Supersonic — a six-max hyper-speed tournament with a $125,000 guarantee. This week a total of 694 entries pressed their luck to create a total prize pool of $142,103.44. Canada was unable to crack the final six this time. The winner was “Durrden” from Germany, collecting $24,198.81. The highest priced Sunday Major on partypoker is the Sunday Supper High Roller, a $2,600 event with $200,000 guaranteed. This week, 79 total entries meant that the total prize pool stayed at $200,000. Three Canadians shared in the prizes. Kristen "krissyb24" Bicknell and "pockjack0" each took an $8,000 minimum cash for finishing tenth and ninth respectively while "Phil_Zamjo" took fourth for $18,000. The winner of this event was Swedish player "GlobalHappiness" who pocketed $57,000 for first place. 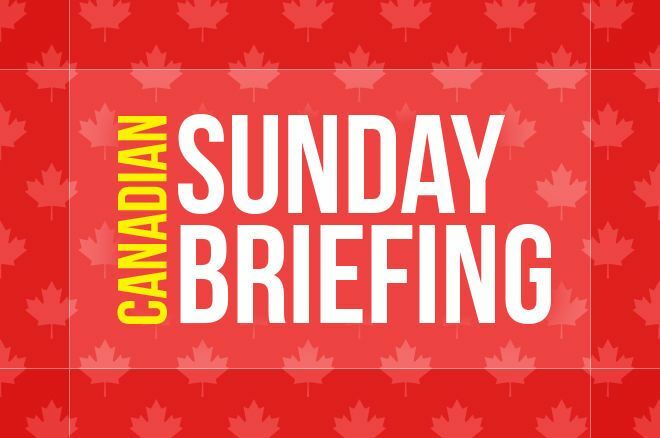 That’s our report of Canadian results in this week’s Sunday majors. If you don’t already have an account on each of these sites, make sure you download through our links and use our bonus codes to take advantage of the best promotions you can find. Good luck; see you in next week’s headlines!